It was an awesome sight, rotating on a tilted platform at the 1948 London Motor Show in Earls Court. Lean, lithe and sensuous, its finely crafted grille, delicately tapered hood, and long thrusting fenders were penned by William Lyons. It marked a departure, a clean break from sports cars of the past. This new 1949 XK120 Jaguar roadster from Jaguar Cars Ltd., had the advanced mechanical credentials and outstanding performance to match its stunning beauty. It was a far cry from the motorcycle side-cars that William Lyons and William Walmsley began building in their Blackpool garage in 1922. Lyons and Walmsley progressed to stylish custom bodies for such cars as Austins and Morrises, and in 1931, incorporated in Coventry as the Swallow Coachbuilding Co. It was changed to S.S Cars Ltd. in 1934. S.S. built its first car that year, using running gear from the Standard Motor Co. with which it developed a long relationship. The S.S.1’s low, elegant lines that made its contemporaries look tall and ungainly became a defining characteristic of the company. Through the 1930s S.S. built several stylish models, including the classic S.S.100 sports car, and introduced the Jaguar name in 1936 on a handsome sedan. S.S. cars offered style and performance beyond their moderate prices. Following the Second World War, now as Jaguar Cars Ltd., it produced sedans of pre-war design until 1948. 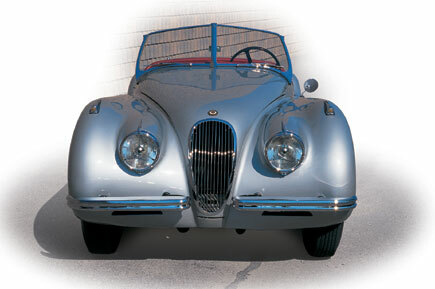 In late 1948 it introduced the new XK120. Following the war Jaguar had decided to replace its Standard engines with its own design, and the XK120’s was the result. 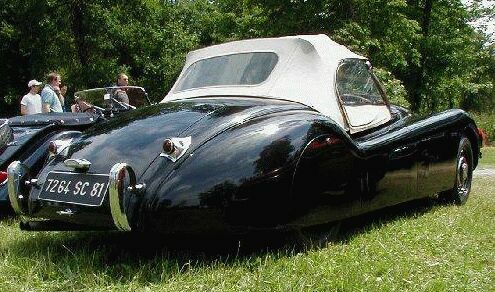 It was originally intended to power the luxurious 1951 Jaguar Mark VII. The XK roadster was to be merely a test bed for the new powerplant, but what a test bed it turned out to be! Jaguar's chief engineer William Heynes designed a 3.4 litre inline six capped by chain-driven twin overhead camshafts. Its robust crankshaft rotated in seven main bearings, and in spite of a relatively long stroke, its 160 horsepower came at a lofty 5200 rpm. The big six would prove itself on the road and in competition, and would live basically unchanged for some four decades. To demonstrate that the XK was not just a boulevardier, a roadster was taken to Belgium’s famous Jabbeke highway. With the windshield removed and a bellypan and tonneau cover fitted, it reached a stock car record 213 km/h (132.6 mph). In standard form it topped 203 km/h (126 mph). So the XK was fast, but would it last? The answer came in competition and closed track feats. A three-car team of competition XK120C Jaguars was entered in the 1951 LeMans 24-hour race. One triumphed, starting a run of five LeMans wins in seven years. In 1952 a Jaguar coupe averaged 160 km/h (100.13 mph) for seven days and nights at France’s Montlhery racetrack. The Jaguar was indeed more than a pretty face. The watershed XK120 Jaguar sports car laid the foundation for the mystique and reverence the Jaguar name still enjoys.